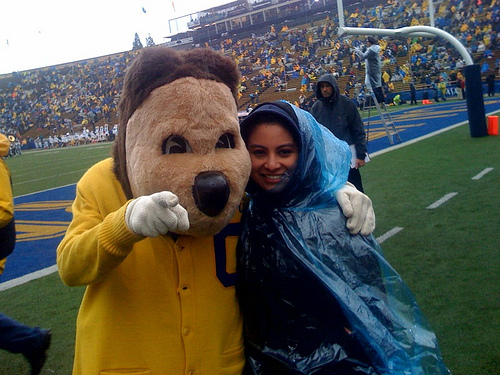 Despite being technically extinct, Oski Bear’s presence is felt nearly everywhere at important Cal events. He’s there to cheer our football team. He’s at the parades. He hugs children and incoming students alike on Cal Day. But did you know an engineer started it all? Berkeley’s “Engineering News” says, “Before Rockwell’s arrival, the California Golden Bears used live ursine mascots with predictably unpredictable results.” Live mascots you say? What would PETA have to say about that? Choosing mascots is a serious business, and you can easily tell how important they are to the success of any team. Just go to a football game! Anywho, make sure to cheer on Oski and the team for Big Game this Saturday! Oh, and for the record, Stanford doesn’t have an official mascot, but, if you look carefully, you might see a tree. No really, we’re serious. It is actually a nice and helpful piece of info. I am satisfied that you just shared this helpful info with us. Please stay us up to date like this. Thanks for sharing. Your site is very very good, i actually liked the content which you wrote, nonetheless it i did want some extra information for the reason that i didnt absolutely realize the conclude.